Finding the highest quality cooking pans on the market today isn’t going to be at your local big box store by any means. With those guys, you’ll only be overpaying for poor quality, and Made in China product. If you believe in cooking up your favorite meals with the highest quality cooking tools, then Blu Skillet Ironware is the company you want to get them from – in particular your cooking skillet. 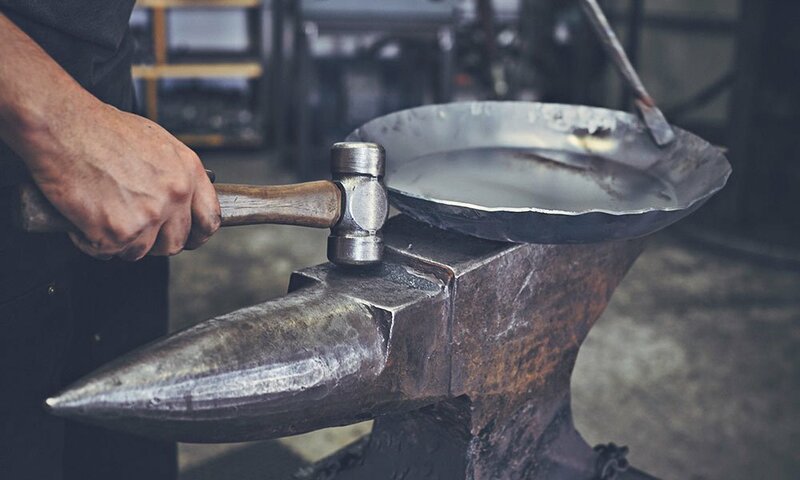 Based out of Seattle, Washington Blu Skillet Ironware is a small team who hand-forges top-notch skillets that (we hate to say it) are practically impossible to get your hands on. This is basically because within minutes these quality skillets are sold out and you have to wait for another round to hit the shelves/online shop to even think about obtaining one. Men’s lifestyle blog, Cool Material, recently paid a visit to Blu Skillet’s headquarters where they got to ask great questions and take very awesome photos. To find out more visit Cool Material’s blog or visit Blu Skillet’s website. Previous post: Chef Life Clothing is on Tumblr! Next post: Free Shipping Offered Today Only!